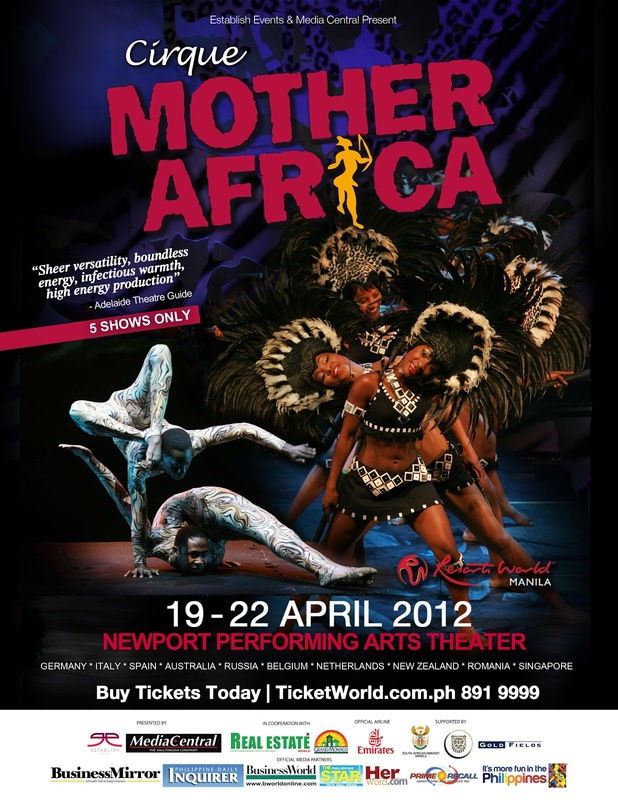 Be dazzled by 40 amazing artists from nine African countries - Ethiopia, South Africa, Kenya, Tanzania, Ivory Coast, Benin, Zimbabwe, and Guinea - as they perform in Cirque Mother (Circus Mama) Africa this April 19 to 22, 2012 at the Newport Performing Arts Theatre in Resorts World Manila. Presented by Establish Events in cooperation with Media Central, Cirque Mother Africa has a similar concept as with Cirque Du Soleil, but with its own unique, different vibe. The innovative two hour show combines African music, dance and performance, and pulsates with the heartbeat of Africa. All artists of Cirque Mother Africa are dancers, singers or musicians and quite often a combination of all three. They have toured and performed sold out shows in Germany, Italy, Romania, Russia, Netherlands, Australia, Belgium and Spain, and will be visiting Singapore before trouping to Manila. Most of our perception of the word “circus” illustrates images of a big top, a ringmaster in a black top hat and tumbling clowns with white painted faces and round red noses. However, Cirque Mother Africa brings in a new-millennium meaning to it. The show will ultimately delight the senses with items spinning through the air, human contortionists who form mind-boggling shapes with their bodies, while percussionists beat African rhythms on drums. Masks, drums, beads, and amazing costumes all add to the authentic African atmosphere. Some of the highlights of the show include foot juggling, magic and illusions, bounce juggling and contortionists. Aside from the entertainment that the audience will get from watching Cirque Mother Africa, Mama Africa's team wants to help in a more lasting way. Part of the income from the tickets sold during the forthcoming Mama Africa Tour will go towards development projects in Africa, for example, Karl-Heinz Böhm's Ethiopian aid project People for People which has been in existence for thirty years. For tickets to Cirque Mama Africa, please visit: www.ticketworld.com.ph or call 891-9999. For Group Bookings, please call Peeya at 0915 9275747. It's my dream to see such perfomance! I hope I will have an opportunity to catch it!